No matter the season, the weather, or the political climate, The Windy City has two unparalleled passions: beer and improv comedy. For over a century, Chicago has been churning out some of America’s all-time favorite comics and brews. Try a variety of tasty local craft beers at several iconic Old Town bars, then stroll down Wells Street and learn all about Chicago's improv and sketch comedy history. 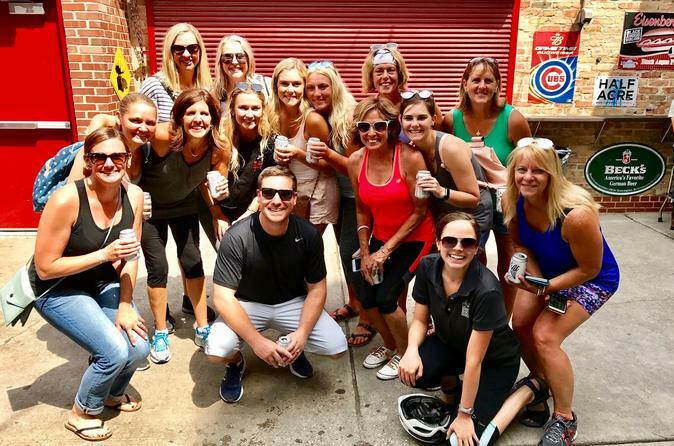 The Old Town Comedy and Craft Beer walking tour is perfect for friends, birthday parties, bachelor/bachelorette parties, guys’ or girls’ weekends, couples, or anyone looking to have a good time! Meet your guide at 2:30 just outside the famed Second City comedy club, where many of Saturday Night Live's greatest comedians got their start. Stroll to the Old Town Ale House and savor a local brew while reveling in the bar's rich history and atmosphere. Patrons have included Anthony Bourdain and Roger Ebert. Next, walk past Zanies comedy club where your guide will explain more of Chicago's rich comedy tradition. Stop at classic dive Burton Place for a "Chicago Handshake," a shot of an infamous local liqueur followed by an Old Style. Next, learn more about the colorful artists who used to populate Old Town, and walk to Old Town Pour House, featuring one of Chicago's largest beer selections. Sample a couple of local brews with a savory snack, and then walk further south past the charming boutiques and restaurants of Wells Street. Refresh yourself with another local pour at Declan's Irish Pub, and then finish the tour at Glunz Tavern, one of Chicago's oldest and most storied establishments.